In an effort to meet the growing demand for electricity and to reduce carbon emissions, the Government has promised a dramatic increase in offshore wind generation. Setting down bold targets for offshore wind power, more than 2,500 wind turbines are to be installed across around the UK coast over the next nine years. With the ambition to create a huge offshore wind industry in the UK, the new targets even go above and beyond those recommended by Government advisers. Mr Huhne will argue that renewable energy sources – such as solar electricity and wind turbines – are essential to Britain if the country is to meet its targets on climate change. 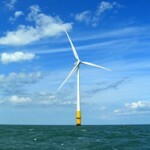 When it comes to targets for offshore wind power, the Committee on Climate Change (CCC) is calling for 13GW of offshore energy for the national grid from offshore wind-farms by 2020. But the Energy and Climate Change Secretary, Chris Huhne, is due to announce a massive expansion plan which will boost generation to 18GW. An industy task force will be established in an affort to bring down the cost of offshore wind from around £140 to £170 per megawatt hour produced currently, to about £100 per megawatt hour by 2020. This would make offshore wind competitive, and should reduce the need for subsidies in the long run. The renewable energy overhaul – alongside proposals for other far-reaching reforms of the electricity market – will be the biggest shake up of the energy market since it was privatised two decades ago. But critics have attacked the plans, saying they could work out to be costly and however far they go, may still not go far enough. There are also fears amongst the industry that the plans are in fact a way of subsidising nuclear energy, without actually appearing to do so, because some of the reforms will benefit all-forms of “low carbon electricity”. Although the coalition has pledged not to “directly” subsidise the nuclear industry, by including it with renewable generation it could very well get round this stipulation. The Government wants to increase the share of renewable energy to 15% by 2020.